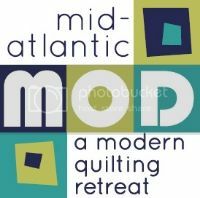 mid-atlantic mod: a modern quilting retreat: Registration is opening soon! Just a quick update to let you know when registration opens. For more information about pricing, dates, etc. please see the Registration link above. If you don't have this information but are a member of one of the guilds listed, please contact your own guild leadership. These few spots sell out very quickly and are allotted on a first come, first served basis. A waitlist will begin on the registration site when the event is sold out following General Registration. Hey thanks a lot for letting us know and this will surely be great. high expectations and will try my best to sign up for it. Hopefully i won't be wait listed.